The subtitle for this gem of a book is “A guide for parents whose child is more: intense, sensitive, perceptive, persistent, energetic.” If you have a child that fits this description, you must get your hands on a copy of this book. What I love about this book is the positive tone and the practical. There’s a section devoted to finding new labels to describe the spirited behaviors that can be so taxing to parents. Kurcinka encourages you to call up your favorite image of your spirited child, the one that “includes the snappy eyes, the infectious grin, the agile body, or the astounding question,” and to hold that image while you “discover the hidden potential” in a list of obnoxious characteristics. Unpredictable becomes flexible and creative. My stubborn, naked child becomes assertive and persistent in the face of challenges. Reading this section actually takes you from despair (how I am ever going to survive parenting this child?!?!) to a feeling of being abundantly blessed with a fascinating child who will one day do, and in fact already does, amazing things. Once she’s helped you obtain this attitude change, Kurcinka provides an in depth course on temperament. Here she discusses introversion versus extroversion and each of the “more” characteristics (intensity, sensitivity, persistence, distractibility, adaptability, regularity, energy, first reaction and mood). In each section she provides a sensitive and supportive overview of the personality trait as well as sound practical advice for preventing and managing the difficulties it can cause. If you’ve read this book, you know that a naked child at church may be particularly sensitive to things like the temperature of a room and the feeling of her clothes on her skin. Combine this sensitivity with intensity and persistence, and well, you end up with a naked kid who refuses to get dressed in the back of the church. This book guides parents into proactively considering the situations that may overwhelm their particular child. At our house, a few minutes spent considering the comfort of our spirited daughter’s clothes, choosing some layers, and discussing whether that really pretty dress will still feel comfortable when she’s been sitting on a wooden pew for a while goes a long way toward a more peaceful Sunday morning. As a spirited adult, I especially appreciate the sections addressing how to cope “if you’re intense/sensitive/persistent too.” Again, Kurcinka’s tone is always encouraging and never condemning. These traits aren’t good or bad. Being “intense” or “sensitive” is no more of moral issue than being right- or left-handed. It simply helps to know what you are so that you can behave appropriately. The last third of Raising Your Spirited Child is full of practical advice for specific situations. There’s a chapter on tantrums, as well as bedtime, mealtime, and getting dressed. The final chapters address the social life of a spirited child including helping the spirited child succeed in school. Raising a spirited child is a unique challenge. It can be overwhelming, particularly when your parenting philosophy is opposed to punitive and physical discipline. 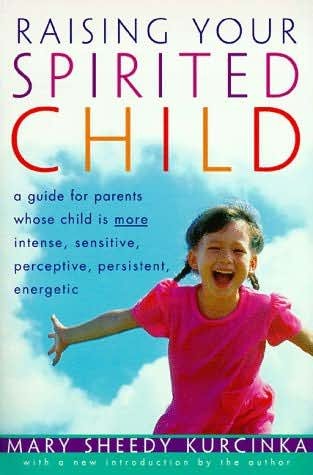 So many parenting books recommend breaking a child’s spirit. But that spirit is a gift from God and a tremendous benefit to your child once she learns to manage it appropriately. No, we’re not to break our child’s spirit, we’re to instruct and guide it so that he can learn to use it to do amazing things.